Telstra’s 2014 WA business woman of the year outlines her remarkable career in mining and work for the advancement of women in employment. Sharon Warburton has built up a vastly impressive portfolio within the mining and construction industries over the course of her 23-year career. From graduating as an accountant, to travelling the world and working on high profile mines and construction sites, to holding a number of board positions at top-tier global mining companies, her path has followed a consistently upward trajectory. However, it is Warburton’s work as a very vocal advocate of women in employment that is sure to become the most important legacy she leaves behind. Her commitment to furthering the opportunities of women in work led to her being awarded Telstra’s Western Australian Business Women of the Year three years ago. With the proceeds from this prestigious award, Warburton set up her own online support network for working women, and called it Steel Heels. Warburton’s interest in mining was sparked from a very young age, when she would travel to the mining towns of Western Australia to compete in sports competitions with her school. “I remember as a young teenager going across to the mining towns for swimming and athletics, and being fascinated by these mines,” muses Warburton. Therefore, after graduating from university with a degree in accounting, it was not unusual for Warburton to enter the mining industry, initially taking a job as a chartered accountant with Hamersley Iron, a subsidiary of the mining giant Rio Tinto. From here on in, she has not looked back. In 1998 Warburton was afforded the chance to move over to Rio Tinto’s head office in London, which was an opportunity she grabbed with both hands. From this position, she was able to travel the world, visiting and working on prominent mining sites in a technical finance role. As her career progressed similar work opportunities arose in foreign locations including New Zealand and the United Arab Emirates, before she returned home upon the birth of her daughter. Becoming a parent brought new challenges as Warburton grappled with maintaining a healthy balance between work commitments and her personal life. It was at this point, as a single-mother simultaneously managing her successful career and parenting, she began to become a visible role model for young women. “I have for some time been a very outspoken advocate of women in those male-dominated industries”, says Warburton. 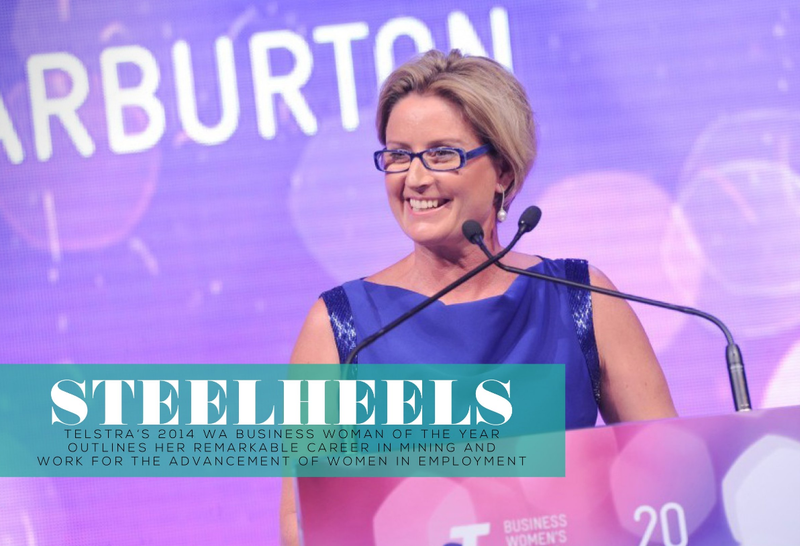 This desire to increase visibility of role models for aspiring young women across many industries culminated in the formation of Steel Heels, Warburton’s own organisation which celebrates the achievements of women in employment across the world. Created using the proceeds from the Telstra award, Steel Heels is an online resource network focused on increasing the self-confidence of working women through sharing stories and increasing visibility for female role models. “The vision of Steel Heels is to provide visibility for role models,” explains Warburton. Features on the Steel Heels website include a range of free content, which predominantly comes from guest contributors who often share a prevalent story or experience for the benefit of the wider Steel Heels community. There is also a selection of premium content for members, who pay a small fee to cover the costs of administering the site. The Steel Heels membership package allows users full access to all current tool kits, an innovative resource package which offers a one-to-one style mentoring scheme to members. When Warburton returned to Australia, she noticed that many young professional women yearned for this type of personalised mentoring, to be able to learn from her global experiences and apply it to their own careers. So why did Warburton deem it necessary to create this support network for women in industries like mining? “About seven years ago, when I came back from living overseas, I really noticed that there was a greater focus on diversity in the workplace, yet I could see that in industries like mining and construction there was a low female participation rate,” explains Warburton. It was at this point that Warburton concluded greater visibility of female role models was desperately needed, along with extensive support networks among women in these male-dominated industries, and the seeds of Steel Heels were sown. Unfortunately, achieving complete gender diversity in the mining industry is a goal that continues to be handicapped by people’s perceptions of women and mining across a wider national and international sphere. “I still often hear stories where women are actively discouraged by parents or teachers or by peers that these industries aren’t focused for women, so that suggests we need to do a whole lot more,” says Warburton. Warburton encourages companies in the mining sector to support initiatives such as family days, which may stimulate interest in the industry among children from a young age, in a similar way that her own fascination was stirred. In fact, a company that Warburton has close ties with, Fortescue Metals, runs a year-round family programme, which brings employees and their families up to the mining operations in the Northwest of WA. These are the types of initiatives that Warburton believes will accelerate the process of gender diversity in mining. There are some encouraging recent signs that the industry is heading towards greater equality between genders, from the grass roots to the upper echelons of major mining firms. It was recently announced that young women will make up half of the total mining apprentices taking part in a BHP Billiton-Mitsubishi alliance work readiness programme. This comes after BHP announced it planned to make half of its workforce women by 2025. Such a strong commitment to gender diversity by the world largest mining company is a major indication the industry is heading in the right direction. Another recent sign of greater gender diversity in the upper regions of the mining industry came in the shape of Elizabeth Gaines being appointed as chief financial officer of Fortescue. As a non-executive director at the company, Warburton knows exactly how important diversity is at Fortescue. “Recently Fortescue became the first company in the ASX top 20 to have five women on its board. With Elizabeth’s appointment as CFO, it became one of the first global mining companies to have a female CFO and I do think that achieving diversity in leadership roles shows a lot about the culture of the organisation. Taking into account these promising developments, Warburton is upbeat about the future of women in mining, and is determined to further expand the support networks that make up Steel Heels, promoting the positions of leading women in the industry to an ever-wider online audience. She also remains as hungry as ever on a personal level, and has recently taken on a new non-executive director role at Barminco. Warburton intends to continue adding value to each and every one of the organisations which she has joined as a board member, while further developing her skills as a director. Warburton has also recently taken on her first chairman role with the Northern Australia Infrastructure Facility, and looking to the future, these are the types of roles she envisages herself being in.